Windows 7: How can I have Media Player 12 open in full screen as default? How can I have Media Player 12 open in full screen as default? I can't find a way to have Media Player 12 open in full screen every time I open a video, mp3, wmv or whatever. I don't want to mess with the registry. Is there a setting that I am missing somewhere? System is Windows 7, Home edition 64bit, 12GB ram, Intel i7 6-core 3.2GHz, 2TB hard drive, ATI Radeon HD5570 graphics. It's an installer, just install and try to open Media Player. See if it works. Tell me how you get on! Almost! It's an improvement in that media player now opens maximized but still needs to be clicked on the full screen icon to get to full screen. It also seems to disable the double click to option to go from maximized to full screen. I have to actually scroll to the full screen icon and click on it to go to full screen. Hi Redwoodk, welcome to the Seven Forums. No need for any third party tools. Simply create a shortcut for WMP, use the shortcut to launch WMP. Set Run Maximized in Shortcut Properties, now WMP opens always full screen. I not a fan of using the Full screen box option it messes with the resolution or it seems to, the F11 key is a better option. Then just drag the window to the top/ left corner of your screen and diagonally drag the bottom/ right corner to fill the screen./ Close. Windows should remember the size next time you open wmp. If not your resolution might not be on the recommended settings or your video card driver might be out of date. I want to open in Full Screen(not maximized) because I link to video clips out of Powerpoint to save on PPT file size. I used to do this seamlessly in earlier versions of WMP which had a default player setting of full screen. Second problem, the shortcut preferences doesn't seem to do anything. All video files will only open minimized. no matter what I choose in shortcut settings. It just seems more professional when I don't have to noodle around adjusting screen each time I bring up a video clip. Videos normally open in their original resolution. If you have a 1920*1080 screen but the video has oroginal resolution of 640*480, that's the size it opens. 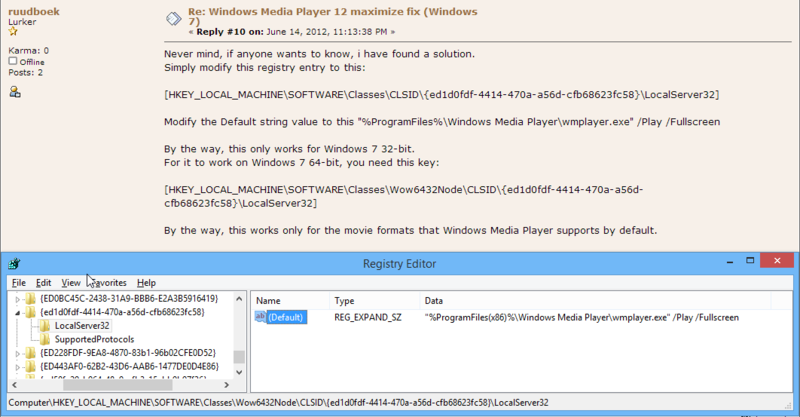 It's a registry edit work in Windows 8.1 Media Player 12. One caveat is you need to right click on LocalServer32 and change permission to full control, otherwise you can't change the registry on the right "error edit value". Good luck for anyone one still looking for this! Btw, I found using PotPlayer, VLC, GOM player, Media classic can easily play in fullscreen by default with an option in setting. I had the same problem. I wanted WMP to open full screen when I played a video. Easy fix. Open your WMP, and at the top left, click on "View", then move your cursor down to where it says "Video size",then click just to the left of the phrase "Fit video to player on resize". Make sure that after you have done this there is a check mark to the left of that phrase. Try your WMP video and problem should be fixed!